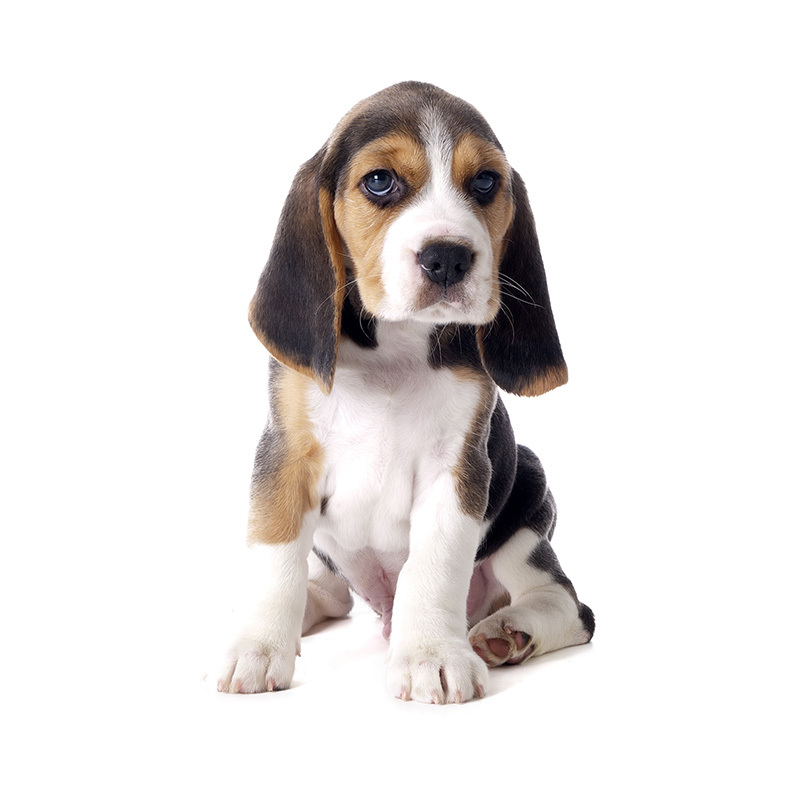 The origin of the word “beagle” is uncertain. A few theories are that it might have been derived from the French word begueule, meaning “open throat;” the Celtic word beag, meaning “small;” the French word beugler, meaning “to bellow’” or the German word begele, meaning “to scold.” They all would make perfect sense as the Beagle is known for its distinctive voice. The Beagle originates from England but the breed can be traced to ancient Greece, having been depicted in paintings. The Romans may also have brought them to England to use as small hunting dogs and bred them with the local hounds. In the mid-1800s a pack of Beagles was established in England by Rev. Phillip Honeywood, and it is thought that they are the ancestors to the modern Beagle. They were designed to find and flush hares. At about the same time, American breeders became very interested in breeding and improving the Beagle. They are now more popular in the United States and Canada than in their country of origin. The Beagle is a gentle, friendly, even-tempered little dog. They have a loving nature about them and are protective of their family. They are good with children because they are gentle and playful. They see themselves as full-fledged members of the family and will demand to be treated as such. Beagles have been described as the Goldilocks of dogs because they’re neither too big, nor too small; neither aggressive nor timid; and friendly but not overly fawning. In short, they’re the perfect dog. They are full of energy and take whatever life has to offer and then come back for more. Beagles usually weigh between 26 to 33 pounds and stand approximately 13 to 16 inches tall, although some beagles can be smaller or larger than the norm. They have a compact and muscular body which requires a lot of exercise to keep it in shape. They are known for their long floppy ears. They have a smooth coat that comes in a variety of colors ranging from black, white, tan, red, lemon and blue mottle, with tri-color as the most common. Beagles are the 20th most popular dog registered with America's Pet Registry Inc. They have 220 million scent receptors (humans have an average of 5 million). They used to be small enough to fit in pockets and were called “Pocket Beagles.” The beloved character “Snoopy” from the cartoon Peanuts is a Beagle.